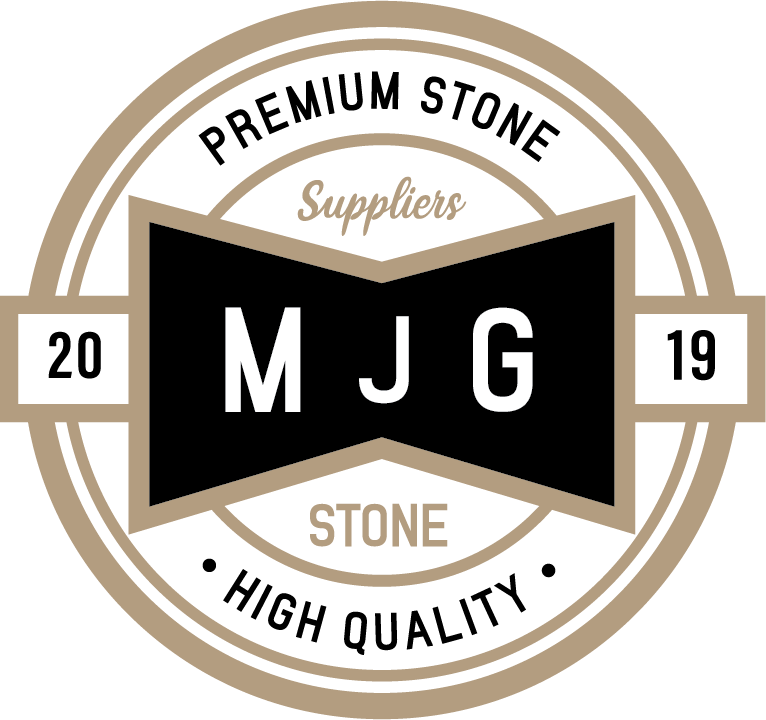 Natural stones often contain traces of iron, which may oxidise when they come in contact with water either through rain or cleaning. The result of this oxidation is that the stone develops rust and discolouration. Lithofin BERO is specifically formulated to remove these blemishes. 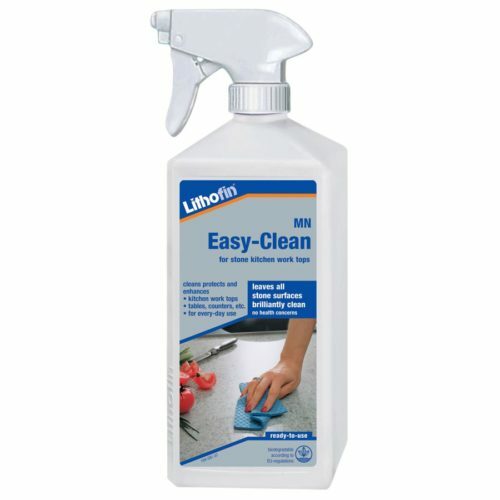 Acid based stone cleaner which contains special rust preventing components designed for long-term effect. Lithofin BERO chemically changes the rust particles, thereby removing rust discolouration regardless of whether it is a result of the iron in the stone or of environmental influences. Cement residues and similar dirt are also removed. Lithofin BERO removes rust and rust discolouration and is also suitable for removing cement residues from iron containing natural stones. Suitable for acid resistant hard stones such as serizzo, cresciano, calanca, and for granites such as sardo white, etc. On polished surfaces, the effectiveness of the product is limited. Suitable for indoor and outdoor use. Dilute Lithofin BERO up to 1:7 with water depending on the type and stubbornness of the blemish. Apply the solution to the surface and spread it evenly. After approx. 4 to 8 hours, rinse with plenty of clear water. In case of very stubborn rust discolouration, repeat this procedure after several days. During the cleaning procedure, the surface must be protected from water. Please Note: always test the product in an inconspicuous area prior to use. 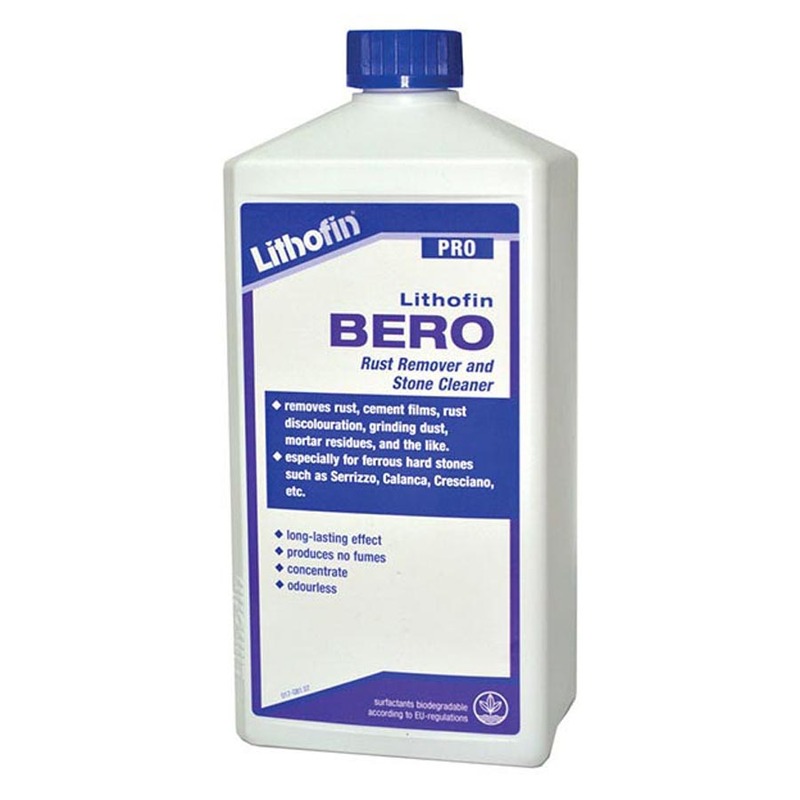 Lithofin BERO must not be used on polished or fine honed marble and limestone, engineered stone or other acid sensitive surfaces. Enamel, zinc and other acid sensitive materials are attacked by the product. Some natural stones may become slightly darker, this effect will disappear after some time. However, always treat the entire surface to ensure an even appearance. In case of single spots, we recommend Lithofin MN Builder’s Clean. Coverage: approx. 7 to 15m² depending on the surface. 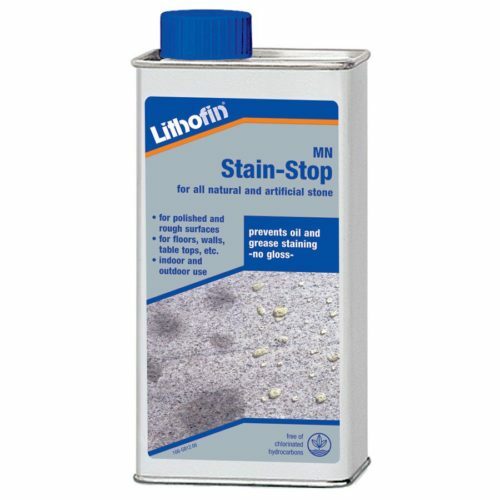 Advice: iron containing stones should always be cleaned with Lithofin MN Builder’s Clean because this product removes light rust discolouration and prevents them from forming. Should Lithofin CEMENT-AWAY be needed because of strong dirt deposits, an after treatment with Lithofin BERO is necessary. 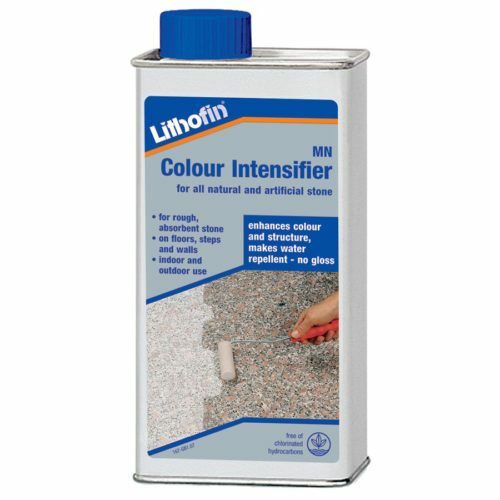 Impregnating the surface with Lithofin SPLASH-STOP or Lithofin MN Colour Intensifier will render it resistant to the penetration of water, thereby greatly reducing the risk of dirt accumulation and rust discolouration. Keep closed and cool. Shelf life of up to 5 years. The contained surfactants are biologically degradable according to EU-regulations. The acids are largely neutralized in the cleaning process. Disposal: diluted product may be added to waste water. Containers are made of environmentally friendly polyetylene (PE). Clean containers can be recycled through collection system. Ingredients: acids, less than 5% non-ionic surfactants, auxiliary agents. Contains phosphoric acid. May be corrosive to metals. Causes severe skin burns and eye damage. Keep out of reach of children. Keep only in original container. Wear protective gloves/protective clothing/eye protection/face protection. IF IN EYES: Rinse cautiously with water for several minutes. Remove contact lenses, if present and easy to do. Continue rinsing. Immediately call a POISON CENTER or doctor/physician.Store locked up. Additional information: is listed on the Material Safety Data Sheet.